GUINNESS "LUCK OF THE IRISH" Graphic on Front (see photos). A Perfect Addition To Your Guinness T-shirt Collection. All photos are of the actual item. Colors: Black. 100% Cotton. Shoulders 37, Chest 38, Length 27, Sleeves 7.5. Shirts 261. Great Super soft black Guinness tee shirt. Size M Chest 42 Length 27. The overall condition of this shirt is Excellent. Collar to bottom - 23". Pit to Pit - 19". NEVER WORN! Enter your favorite pub in style with this shirt. 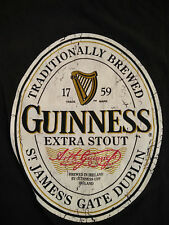 This is a black t-shirt representing the popular beer, GUINNESS by Gildan. It is a simple, but sharp shirt, featuring the picture of the characters across the front. Extremely RARE ORIGINAL Vintage Guinness Extra Stout Beer National Anthem Party Celebration Happy Holidays adult 2 Sided T-shirt Is up for sale. This shirt is still new without TAG! Actual measurements: TAG size: M Pit to pit: 20" Collar to hem: 28" I usually ship within one day of receiving payment. PayPal only Won't last! Guiness S/S T-Shirt Mens Medium Relaxed Fit Dark Green . Condition is Pre-owned. Shipped with USPS First Class Package. Olive green with Guinness logo. The shirt pictured is the item that you will receive. Top to bottom - 28". Pit to pit - 19". Graphic Tee Dark Ash Gray Cotton. Condition is Pre-owned. Color: Gray. Gender: Adult. Length: 27". Chest: 18". The REAL DEAL - Made in Ireland! Brown cotton shirt with Guinness and harp logo. Adult size M. Relaxed fit. 21" across bust/chest. PREOWNED SHORT SLEEVE BLACK GUINNESS BEER TSHIRT. Pit to Pit 19 ". SIZE ADULT M. Top to Bottom 26". 100% COTTON. Length - 28” Underarm to Underarm - 22” White with dark green sleeves. Please ask all questions before buying. Guinness Style. Center Of Tee In Yellow Letters Guinness Dublin Extra Stout. Short Sleeve. (67) This Shirt is in Very Good Condition. Shoulder to shoulder: 17. CERTAIN it will fit . We will make every attempt to make things right monetarily or otherwise, when possible. THINGS TO KNOW ABOUT Mar-TEE’S and Such . CLASSIC AND PRINT IS ON FRONT, A MUST FOR ANY GUINNESS FAN AND READY FOR THOSE CLASSIC UPCOMING EVENTS. T-SHIRT IS SHORT SLEEVED. COLOR: HEATHER GREY. BACK BOTTOM OF THE COLLAR TO THE HEM: 24 1/2". ARMPIT TO ARMPIT: 21". TOTAL LENGTH: N/A". SHOULDER SEAM TO END OF CUFF: N/A".